The isolated Galapagos Islands are a haven for unusual and interesting animal, plant and insect species. Some species live only on the islands -- sometimes just on one of the 13 islands in the chain -- while others can be found elsewhere in the world. There are several species of Galapagos butterflies, some of whom might have relatives living in your backyard. Endemic butterfly species are those that can be found only in the Galapagos Islands. The queen butterfly is brightly colored with black lines on her wings; the bright colors warn birds that she isn't tasty. Queen butterflies are seen mainly on the island of Isabela, although a few have been spotted on Floreana, San Cristobal, Santa Cruz and Santiago. The Galapagos blue butterfly is small and alert, moving quickly away from animals that might want a butterfly treat for dinner. It's found throughout the islands, mainly on Espanola, Fernandina, Floreana, Isabela, Marchena, Pinta, Pinzon, San Cristobal, Santa Cruz and Santiago. The large-tailed skipper is small and brown, and it's been spotted on all the main islands in the chain, although it's not as common as the Galapagos blue butterfly. The large-tailed skipper can be seen on the islands of Espanola, Fernandina, Floreana, Genovesa, Isabela, Pinta, Pinzon, San Cristobal, Santa Cruz and Santiago. Some butterfly species live in the Galapagos and other parts of the world, but because the Galapagos Islands are so isolated, the resident butterflies develop slightly differently than others of the same species. These are considered subspecies, and there are a couple of them on the Galapagos Islands. The Galapagos sulfur butterfly is the only butterfly on the islands sporting yellow wings. The Galapagos silver fritillary is a subspecies of the gulf fritillary, found on the mainland in South America. This butterfly is black and orange with silver spots under his wings, and he's found on the islands of Fernandina, Floreana, Isabela, Pinta, San Cristobal, Santa Cruz and Santiago. Some Galapagos butterfly species are found in many locations throughout the world, including North America. Painted ladies are red and orange with black designs on their wings, with the underside colored with pastels. Find painted ladies on Isabela, Santa Cruz and Santiago islands. Monarch butterflies are the largest species in the Galapagos, but it's also commonly seen migrating in large groups in North America. Their wings are brownish-red with black lines and white spots and are most commonly seen on the islands of Floreana, San Cristobal and Santa Cruz. Whether the butterfly species is endemic or widespread, it serves an important role in the Galapagos Islands: pollination. Flowers bloom only part of the year in the Galapagos, but they require pollination to survive. This is normally covered by bees, with butterflies usually considered secondary pollinators for many plants. In the Galapagos, however, there's only one species of bee: the carpenter bee. That makes butterflies more important for the continuation of flowers on the islands because they help the bees pollinate. 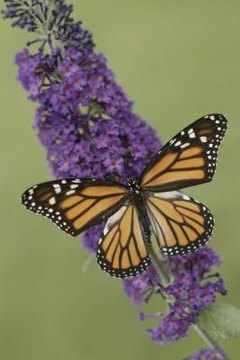 The butterflies thrive in the rainy season -- typically December through May -- when the plants bloom vigorously. They hide from the rain hanging upside down from the underside of leaves or hide in craggy cliff faces, taking care of their pollination duties when the rain subsides.